Are you ready to upgrade to a flooring product that won't scratch or fade after many years of use? Discover the difference a new ceramic tile floor can make in your home or business. Whether you're looking to change up your building's appearance, or you're tired of looking at worn or outdated floors, ceramic is a great option for almost any room. Go online or visit our flooring showroom to explore a large selection of ceramic products designed to complement your living space or workspace. We're proud to carry products manufactured by trusted brand names, including Floorcraft™ and Design Distinctions™. Change your flooring and see an immediate transformation of your home or business. Our ceramic tile flooring is a quick and affordable method of improving the design and functionality of your home or company. We stock a wide selection that matches any sense of style and works in any room. From trusted brand names like Floorcraft and Design Distinctions to our own creations, you’re sure to find exactly what you’re looking for. We also back these products with fade, stain, and wear warranties that can last for as long as 25 years! Each ceramic tile floor we sell is completely customizable. You get to pick the size, shape, color, and texture you like. Our showroom is set up so you can explore on your own or with help from our professionals. We know the best types of tile, the benefits of each, and how to stay within a budget. Whatever flooring questions or concerns you’ve got, we can address them fully and quickly. Why Buy Our Ceramic Tile Floor? We’ve got the buying power you need and the local service you appreciate. Our flooring experts and associates are happy to let you know your options for whatever ceramic tiles you choose. That’s why we offer free consultations with measurements and a free downloadable app that lets you try out new styles in your room before you buy them. We want you to feel as confident in your purchase as possible and make every effort to see that you are. If you’re looking for practicality and beauty, our ceramic tile offers both for a price you’ll love. Families with pets and children love it, as the material is less slippery and therefore a safer play space. Plus, the maintenance is quick and easy. A simple mop, sweep, or vacuum will do it; no special cleaners needed. The design versatility makes tile work anywhere, but its strong resistance to water makes it ideal for bathrooms and kitchens. Bring the best of beauty and function to your home or business with a ceramic tile floor that lasts a lifetime. Ceramic is an affordable alternative to many flooring materials, and it stands up well to the test of time. Busy households do well with this flooring’s durability and easy-to-grip surface, which makes it a safe play area for pets and children alike. Whether you're seeking installation services for a residential or commercial location, you can trust your project to our skilled team. Protect your investment and ensure its longevity and performance with ceramic tile flooring installation services from our skilled installers. Before we begin, our team takes your room's measurements to ensure you don’t receive any more or less than you need. In addition, we offer some of the industry’s best warranties. If you aren’t satisfied with your installation for any reason, we provide you with our Lifetime Installation Guarantee, which means we’ll make it right at no charge to you. Residential and commercial customers alike can benefit greatly from our products and services, which always work to raise property values. 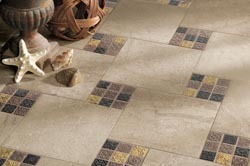 Our ceramic tile flooring installation is guaranteed to protect your investment with the look and performance you want. We take the measurements for you and tailor the flooring materials to fit the room of your choice, so that you don’t get more or less than you need. By the time we’re done, your flooring will be even and laid down to last a long time. Our skilled contractors always clean up when they’re finished and you’ll enjoy your new floors at a faster pace than you ever imagined. Contact us to see the dozens of different ceramic tiles we carry. We’re proud to serve the communities of Bradenton, Sarasota, North Sarasota, and Palmetto, Florida, and surrounding areas.